A couple weeks ago, I had to rearrange my rules so that our dedicated computer for paperless would work better for our whole office (and not just me anymore). 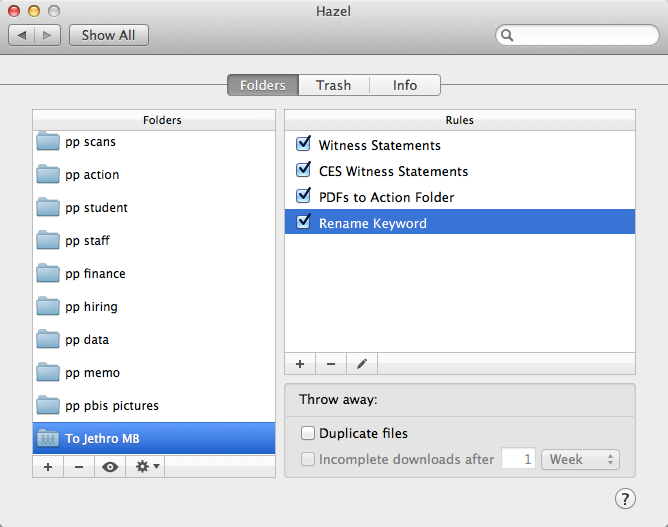 I had to put the Hazel rules for renaming things in a different folder, and a bunch of the documents that should automatically be renamed to "witness statement" got renamed to a bunch of gibberish. In the move, I had put the "Rename according to keyword" rule above the "Rename Witness Statement" rule. When I moved the order of the rules, it worked perfectly again. Keyword Rule is on the top, not where it belongs. When you are creating your own Hazel rules, take into consideration what the most common rules you'll need are, and then be mindful that if something isn't working, it could be as simple as a reorder of your Hazel rules. Keyword on the bottom where it belongs.